Over the years, the Stingers women’s rugby team has become a source of pride for Concordia. Led by longtime head coach Graeme McGravie, the team has won provincial championships in three of the past four years. At the national level, the Stingers have earned a silver medal and finished just short of a bronze medal twice under his lead. Naturally, McGravie’s expectations are high for this season. “I want us to be as competitive as we always are, win every game, win the conference and go the nationals,” he said. Interuniversity Sport female Rookie of the Year Bianca Farella this season. In July, Farella was part of the Canadian national women’s rugby team that finished second in the Rugby Sevens World Cup in Moscow, Russia. But she’ll be unable to play for Concordia this season, as she’s currently preparing with the national team for November’s Dubai Rugby Sevens tournament. In addition to Farella, the Stingers also will have to play without fly half and former captain Jackie Tittley, a three-time CIS All-Canadian who graduated after last season. He’ll nonetheless have to try, and will be counting on a few rookies to fill the void. Among them is centre Alexandra Tessier. A Dawson College grad, Tessier represented Canada in last year’s world university rugby sevens championships. McGravie will also be counting on flanker Hughanna Gaw’s return to help lead the team back to nationals. Gaw, who missed all of last season with a knee injury, was named to the CIS All-Canadian team and was also CIS Rookie of the Year in 2009. The Stingers women’s rugby team’s first game of the season is Sunday, Sept. 8, when they’ll take on Carleton University, 1:00 p.m at Concordia Stadium. Despite finishing atop the Réseau du sport étudiant du Québec conference standings last season, Concordia’s men’s rugby team ended up losing the provincial championship game to the McGill Redmen for a third straight year. “[The Redmen] had some physical and skilled players who took advantage of some lapses and mistakes that we’ve made,” said Clive Gibson, head coach of the Stingers since 1996. Gibson has led the Stingers to five provincial championships in his career. To win his sixth this season, he’ll be counting on team captain and all-star centre Joseph Fulginiti to lead the way. Fulginiti was Concordia’s top scorer last year with 40 points—the third-highest mark in the RSEQ conference in 2012. Nonetheless, the return to the championships won’t be easy without all-stars Kevin Elliot and former team captain Dario Pellizzari, both of whom graduated this year. Fortunately for the Stingers, however, the team will have an extra week of preparation for the season, as they’ll be starting Week 1 with a bye week. “I think the bye week is going to help us; I hope it will help us win our first game,” said Gibson. Exhibition games have also helped. 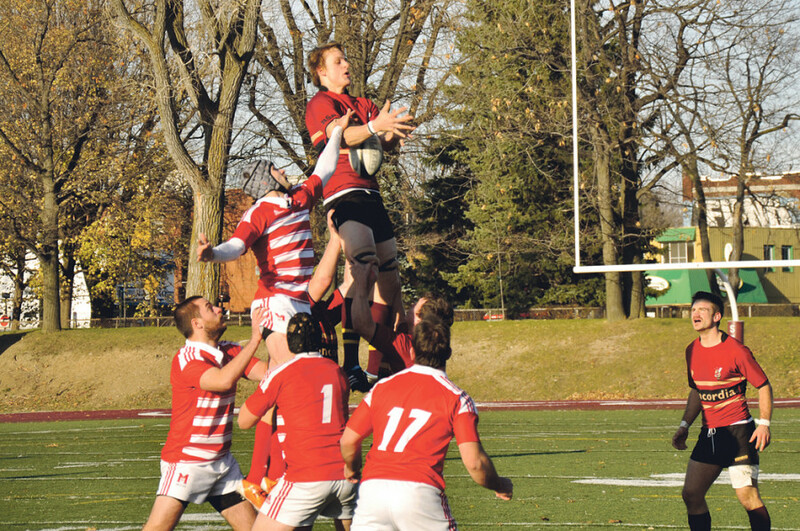 Gibson’s squad played two this preseason, losing one against the Royal Military College of Canada 20-0 and winning the other against Syracuse University 38-0. “Exhibition games are a great experience for rookies, but also for the coaching staff to see the players in different positions and see what they can do,” said Gibson. The Stingers open their season at home on Sept. 15, when they’ll take on Sherbrooke University at 1:00 p.m.